I liked the post below by Andrei linking the night train comic to the Shield. 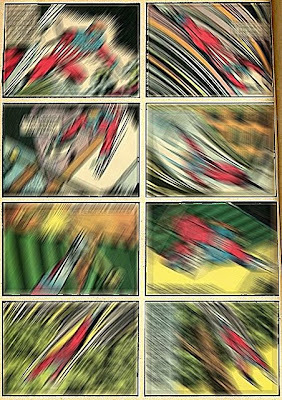 As a bit of an experiment, I transformed the Shield comic lightly in Photoshop, adding a movement blur to each panel exactly in the direction and angle that the superhero is moving. It looks pretty cool. Good composition, Mr Novick! what you did to the image makes me think of audio effects, such as distortion. what's surprising is that it doesn't look like photoshop tricks, it looks specifically determined. this is further proof that photoshop itself is not a villain... I love what happens to the color and the amount of blur and the direction of movement - taking a familiar into abstraction.